Sally Russick's Annual Ornament Swap/Blog Hop! I have been participating in Sally Russick's Ornament Swap/Blog Hop for years, and it's so much fun every year! Sally partners us with someone and we make a holiday ornament for them! Today is the reveal! My partner was Alicia Marinache from Canada! 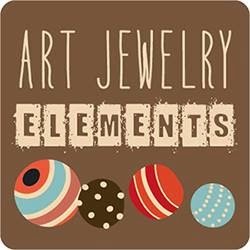 She makes awesome jewelry which you can find here in her ArtFire store! Isn't it wonderful? Her wirework on this piece is really awesome! It can be worn as a pendant OR used as an ornament! I'm thrilled with it! Thank you so much Alicia! And here's what I sent Alicia! I always stress over what I'm going to make, and it takes me a little bit of time, but I'm really happy with what I came up with this year! This year I made a red lentil shaped bead (it's large, 1 1/4 inches) and wrapped it in pure 22k gold leaf with a swirl imprint. I strung it on beading wire with rhinestones, gold saucer beads and a swirl star charm! Please visit everyone else to see what they made and received! And THANK YOU to Sally for hosting the ornament swap again this year! I always look forward to it! 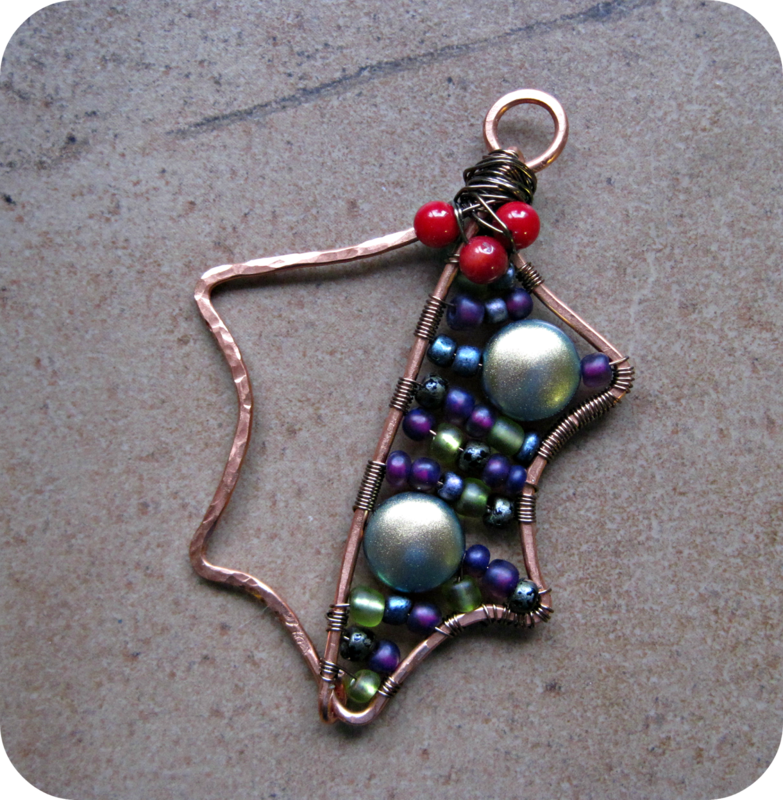 Alicia's wire wrapped leaf is gorgeous - I LOVE THAT! I had one of your smaller red beads - this looks perfect in an ornament! Beautiful job to both of you! Sue, I am so happy you like my leaf! I love your lentil, it is simply perfect for me - love the colour combination, one of my favourite! Thank you for being such a lovely partner - Merry Christmas to you and your loved ones! Alicia made such pretty one! Great combo of beads and wire. Sue - I always love your glass. the gold accents are festive! Happy Holidays! Both of these are such great ornaments. I love the holly leaf that Alicia made and your lampwork with gold leaf is awesome. Beautiful ornaments. I love the ornament you received from Alicia it is so pretty and I like that it can be an ornament or worn as a pendant. The lentil bead you made with the gold leaf is gorgeous I love it! It is going to look beautiful on Alicia's tree. What a beautiful ornament! I love the gold foil highlighting the red of your bead. Perfect for this time of year, but it can also work year round. Red for good fortune and joy, as in the Chinese culture. 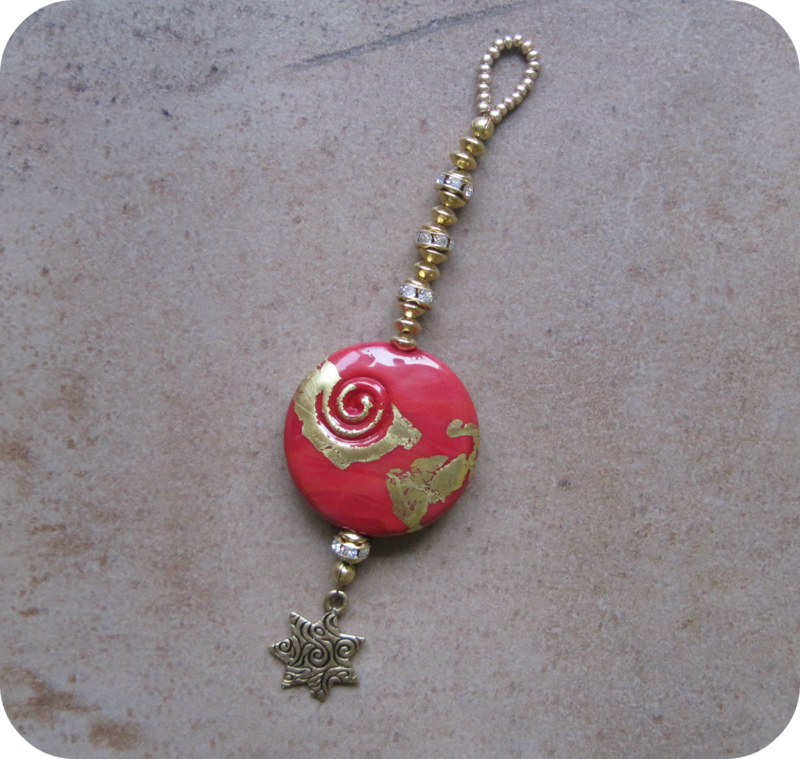 Beautiful bead Sue - the red and gold are really amazing together in your stunning creation! I love Alicia's ornament. It's so creative and looks so cool. Your beads are always so nice, and this one .. wow! It must be the red color. The gold leaf is so striking. It looks amazing! Hi Sue, The holly leaf from Alicia is wonderful. Her wirework is so beautiful. I like how only half of the leaf has beads and the other half is open. I have admired your beads for a while now. The ornament that you made Alicia is fabulous. Great job. They're both lovely ornaments.. I'm in sort of a bah humbug mood after discovering that my blog had been hacked Friday night.. took 4 hours yesterday morning to get it back... Gather it's a Christmas hack they do it every year to random blogs... Hope you have a wonderful holiday! Sue, you know I love your lampwork so much and this is no exception. The color and gold leaf on that bead is amazing. Alicia's wired/beaded holly leaf is very cool. You should definitely turn it into a necklace after the holidays! I love what you received - the wire work is awesome and I love the color of the beads she used! The ornament you sent is stunning - I love that color red with the accent of gold. Sue, the ornament you received from Alicia is so pretty!! I love the meticulous wirework and all the lovely texture created by those pretty beads. I bet your ornament sparkles in the glow of the christmas lights, the gold foil accent and red makes me think of royalty!! Thank you so much for participating again this year!! Merry Christmas to you and your family!! !